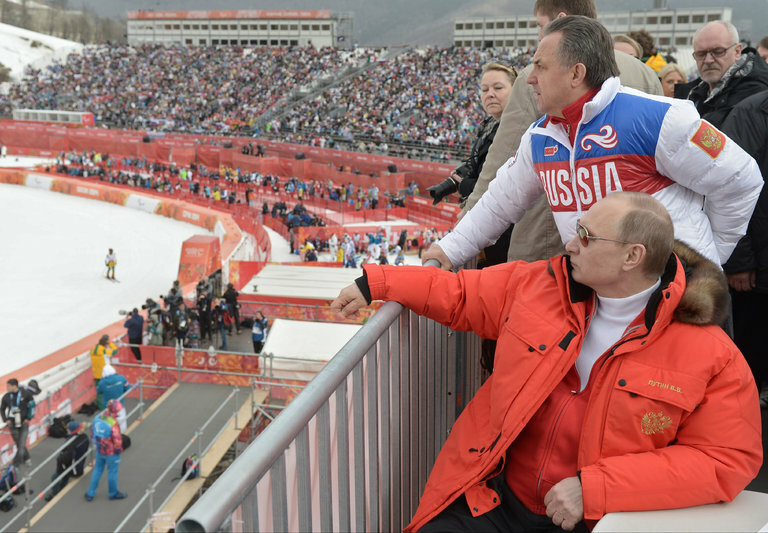 Russia’s president, Vladimir V. Putin, watching the downhill ski competition at the 2014 Winter Paralympics in Sochi, Russia. Russia has been banned from the 2018 Paralympic Games, officials announced Monday, refusing to lift a restriction because of what they called an insufficient recovery from the Russian doping scandal. Nonetheless, those officials said, certain disabled Russian athletes will have the opportunity to compete at the coming Winter Games — a decision taken with some disagreement among top Paralympics executives, who were unanimous in their decision not to lift the ban. Justifying the continued ban, Mr. Parsons pointed to Russian officials’ lacking cooperation with global sports regulators as well as their failure to acknowledge the evidence of systematic cheating laid out nearly two years ago. Critically, however, he also praised “solid progress” within Russia with respect to antidoping education and drug testing — progress that had inspired confidence in the organization’s ability to distinguish between clean athletes and tainted ones, he said. The Paralympic decision stands somewhat in contrast to the International Olympic Committee’s ruling on Russia’s participation in the 2018 Winter Games next month in Pyeongchang, South Korea. Unlike their Olympic counterparts, Paralympic officials had not previously allowed Russian athletes to bypass the ban and compete as individuals outside of qualifying events this fall. Olympic officials, who nominally banned Russia last month, have given 169 Russian athletes special clearance to compete when the Olympics begin on Feb. 9. The Paralympics, the global showcase for disabled athletes, will follow on March 9. Mr. Parsons said Monday that Paralympic officials would allow up to 35 Russian athletes who met “strict conditions,” including a rigorous history of drug testing, to compete in Pyeongchang as neutral athletes in a handful of sports, including Alpine skiing, biathlon and wheelchair skiing. That number that is roughly half the size of the team Russia typically sends. Asked by a Russian journalist why Paralympic officials were not similarly allowing Russian athletes to show their national pride, Paralympic officials stressed that there were consequences, given that Russia remained suspended. “We cannot use the name Russia in the title of team,” Craig Spence, spokesman for the International Paralympic Committee, said. Russia’s state-backed cheating, deconstructed in investigative reports in 2016, corrupted the results of numerous major global competitions across disciplines and years — most dramatically the 2014 Olympic and Paralympic Games in Sochi, Russia. At those Paralympics, the host nation won 80 medals, nearly five dozen more than the second-ranking country. In the roughly 18 months that followed, Paralympic officials outlined criteria for Russia’s path to reinstatement, including that Russian officials accept the detailed evidence of their systematic cheating. Another stipulation was that Russia’s antidoping agency be recertified by the global regulator of drugs in sports. Last November, that regulator denied Russia’s appeal for reinstatement, citing, in part, Russian officials’ lack of cooperation in sharing evidence from Moscow. Russian officials have apologized broadly for doping problems while refuting that the state directed widespread cheating. This month, hackers tied to the Russian government released a new crop of stolen emails seeking to expose and perhaps stoke discord between global sports officials and antidoping authorities. Russia’s inability to participate in the last Paralympics in Brazil provoked particularly pointed outcry from top Russian officials. President Vladimir V. Putin criticized the ban as “outside of the law, outside of morals and outside of humanity,” characterizing sanctions against the nation’s handicapped athletes as a Western effort to humiliate Russia’s weakest, most vulnerable citizens.